I found Ada Jarzębowska’s work while schussing around on my personal Instagram account. I was smitten by her light line and colour choices. I noticed that Ada is a fan of bold combinations of colour and collage – totally our thing! I asked her to create a limited fall-winter collection. Zosia: What was your inspiration? Ada: My inspiration was the sporty fashion of the 80ties. What fascinates me about it the most is the bold colour choices that really please my eyes. I see that this sporty trend is on the rise again. I think that dog’s accessories aren’t something that only serves them. 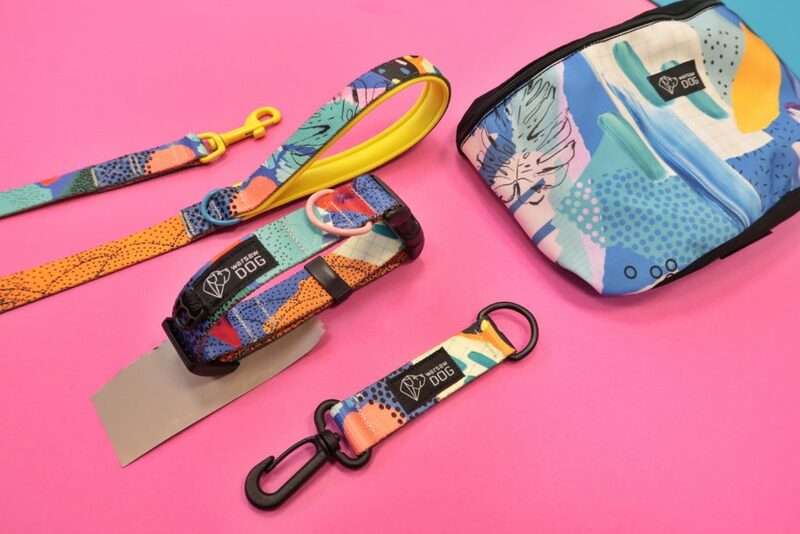 Dog attire can be something that completes the caregiver’s groove so I decided to take the risk and check how these colours go on the dog collars, harnesses and leashes. Z: How was the pattern created? A: The first step was to come up with the colour palette. I made several colour sets but I must admit that from the beginning my favourite was the one that you picked because it met all of my goals. At the same time I made a simple sketch by hand. It let me plan out the elements of the pattern. The next phase was to use a graphic design software to slightly modify the project for it to meet all of the technical requirements. Juicy yellows against purples and greens bring to mind the night time play of neon lights. The neons, created by artists and architects, used to brighten up the gloom of the 20th century Poland. They were coming to life in craftsmen co-ops and had their peek up to the early 90ties. Nowadays, they are coming back to good graces accompanied by vinyl records and PRL* inspired design. “The evening lights are the symbols of the city’s size. The stronger they burn the stronger must be the rhythm of life of the assemblage of people.” – this is how in 1936 “Gazeta Polska”** was writing about them. Every neon is made with precision and careness. Back then, as well as today, what delights us is their artistic value. Overall, that’s where the inspiration for names Neon and Argon came from. The collection is available on our store in the form of a collars, harnesses, leashes, car belts. The products come in different sizes and widths – the offer is adapted to both puppies weighing 3.5 kg and those weighing over 40 kg. 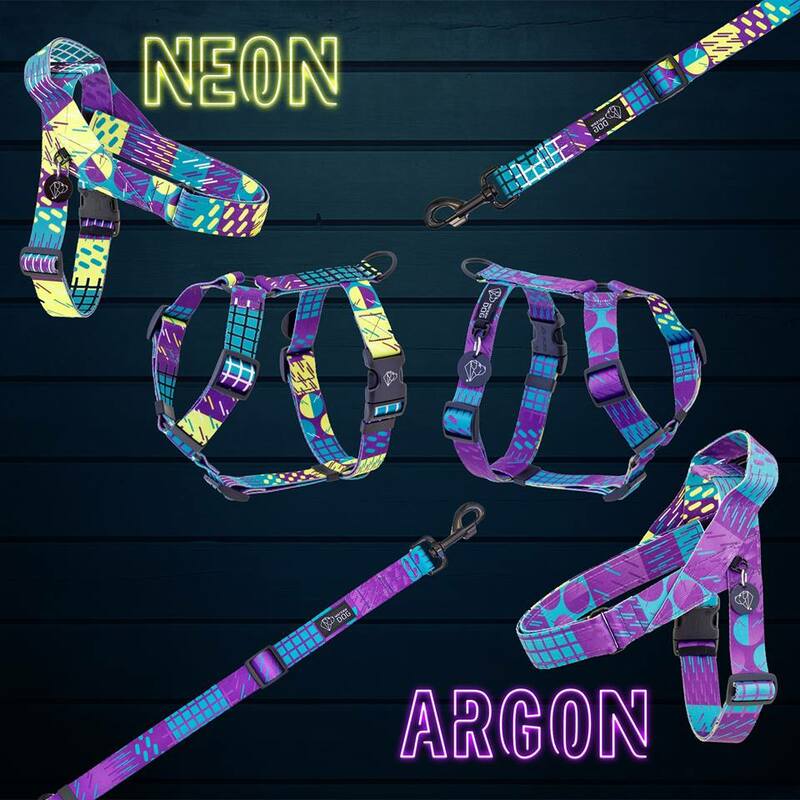 Neon and Argon are two sides of the same webbing from which we sew products. You can decide if you prefer to sew a collar or harness with yellow elements on the top (Neon) or you prefer subdued moods like in Argon. Neon advertisements in their glory days were made by artists – they still stand for individuality and present an exclusive form of expression. Each neon is different, made with precision and accuracy. We believe that your son/daughter of wolf and the bond between you two is just as unique. We are sure that your dog always illuminates the darkness around with personality during walks in rainy season just as neons light up the city. The other side of the Neon pattern is Argon. Argon is the element responsible for the purple color in the neon. Neon advertisements in their glory days were made by artists – they still stand for individuality and present an exclusive form of expression. Each neon is different, made with precision and accuracy. We believe that your son/ daughter of wolf and the bond between you two is just as unique. We are sure that your dog always illuminates the darkness around with personality during walks in rainy season just as neons light up the city. The other side of the Neon pattern is Argon. 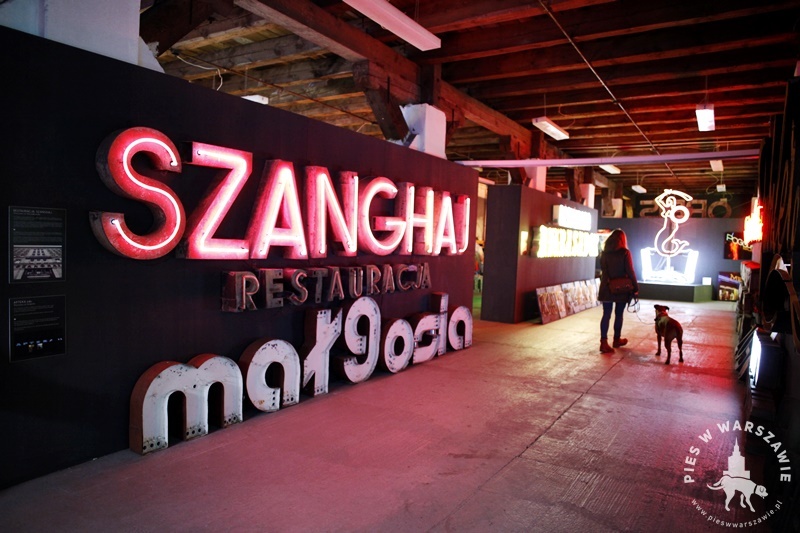 The neon collection can be seen in the Warsaw’s Neon Museum. I visited the museum with Milka the boxer, back in a day when Warsaw Dog was still in its infancy. You can bring your pup to this special museum for free. You can see the footage from that visit on the Międzygatunkowa Rodzina blog under this link.